I reserved today for my car and Ziv. Mind you, this is going to be LONG LONG post. Since, today is not a working day, Kevin had made an appointment for me at Subaru for car servicing. Woke up at 930am and realised that Ziv was still in land of Nod with Barney. Digress a little here, the thing about kids is that, they seems to be able to differentiate weekday and weekend. My current job requires me to wake up slightly earlier than the other jobs which I have had. And I noticed that Ziv is waking up earlier and earlier each day, and somehow, he is adjusting his sleeping timing to match mine! 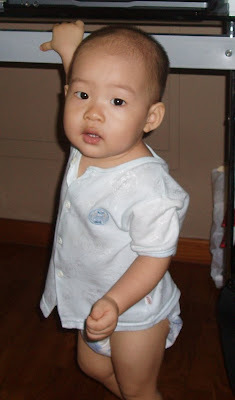 These days, instead of waking up at 830-9am (usual timing), he will wake up as early as 645am to 715am! Why? So, one day, he woke up crying and hugging me tight. Usually, I will shove the pacifier into his mouth or quickly get the maid to make him milk to hush him up, however, both tactics failed severely. Then, I realised, he was trying to make me stay at home with him! He did not want me to go to work! He was probably also angry that he woke up without me for the past few mornings. To diffuse his anger, I had him to sit beside me, putting his hand over my shoulder while I did my makeup, man, that was really tough. After minutes of coaxing and acrobatic acts to make him smile, he finally agreed to let me go. So, today a weekend, he somehow knows that Mummy is not going to work, and hence he is getting a longer sleep. So yes, we drove 2 cars to the car workshop at TPY, while waiting for my car to get serviced, Kevin brought us to TPY Crystal Jade for dim sum. At around 1230pm, my car was ready for collection and Kevin drove us back and then I was alone with Ziv. I decided to bring him to Bishan J8. Frankly speaking, I don't have the courage and capacity to bring Ziv out alone cause I deem it as a chore. I remembered bringing him out to Hyatt to meet a friend for lunch, and in the end I had to carry the sleeping boy, looking all unglam on the streets of Orchard Road. I still had to even ring up Kevin to send us home. Nowhere will be as 'safe' as Bishan cause I KNOW the way from TPY , and to home and I need not look glam in Bishan. So all criteria met! First stop, shopping center. Every hanger that I took, Ziv had to touch. He wanted to get involved with my shopping. So, change of venue. Next up, library. Headed straight to the children section, thinking I might have a good rest there since Ziv liked to flip books. Wrong wrong wrong. This boy was enacting the role of a Librarian. 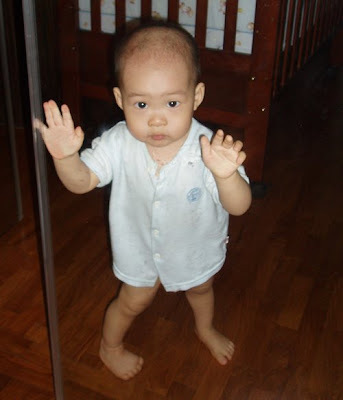 He stumbled on steps, crawled and did everything which I do not allow him to do. He disturbed other young readers, snatched their books, piled up books and then moved them away from one shelf to another, one crate to another... non stop. For almost half an hour or so, I saw him repeating the same actions. All of a sudden, I felt like going to the loo. I looked at him and I thought, "How am I going to the toilet with Ziv?" That's the problem when bringing a toddler out. How to go to the loo? Anyway, no point delving into details of how I managed to struggle to the toilet and how bad it was in the cubicle. Argghh... you wouldn't want to know. After about half an hour or so, we left the library and headed back to the mall. I brought him to the toy department and he played with the toys and then I decided to go to the confectionary to buy him some cakes for breakfast. Shucks! On the way, we saw a Barney car and Ziv was pointing excitedly to the car and wanting to sit on it. Unfortunately I did not have any 1dollar coin and he was crying when I dragged him off the car. Every one in the mall looked at me, as if I was an abusive mother. Ignoring the stares of others, I brought him to Crystal Jade confectionary. Before I could actually make it to the counter, this boy demanded me to open up the packaging so that he could eat the cake ON THE SPOT. I paid for it and let him have the cake. I brought him back to the Barney car since I managed to get back some change and the boy was a happy boy with Barney and cake. Carried him back to the car and onto his car seat, the boy was still eating the cake. When I drove the car out to the main road, I turned beside me to see the boy fallen asleep with crumps all over his face and shirt. It was a very adorable sight. 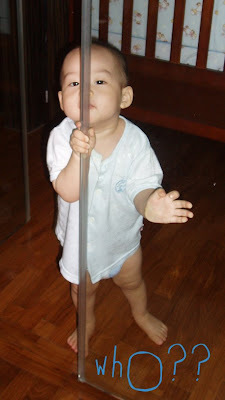 Despite being so naughty and demanding, I think I will still bring him out alone in future, perhaps to somewhere nearby. As for Orchard, hmmm... we shall see. Been down with a nasty flu since Friday. Have been sniffing and snuffling in the office and some colleagues have been avoiding me like I am a plague. Can’t blame them, cause who wants to fall sick over the precious weekend. I have been gearing up for a delivery milestone for the end of August, so this week and the coming week is going to be hectic. Some said that I am a workaholic, but I am enjoying every bit of the job because it makes me occupied. I sent out emails on Saturday, I sent proposal out on Sunday and it doesn’t make me any miserable cause the fact that I am enjoying my work. In fact, I am happily tugged under my quilt with a laptop on top of my lap. Kevin has to literally drag me out of my smelly pajamas and oily hair to catch a show later. Not Botak Jones. 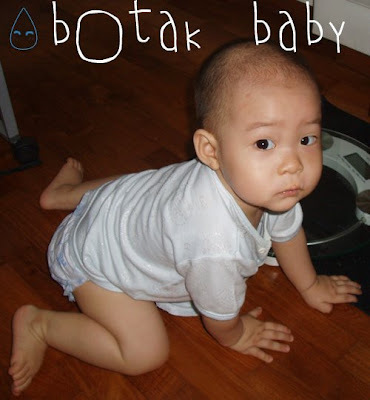 Its Botak Ziv. Finally pluck up the courage to shave Ziv's hair. For $20, it is what you get. 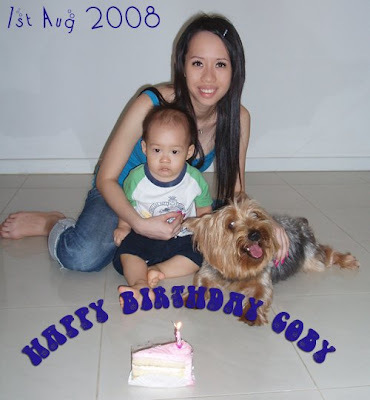 Our big baby, Coby turned 4 on 1st Aug 2008. As usual, we bought his favourite snacks and whatnot from US Bakery, and of course, the birthday cake! Unfortunately, it wasn't a whole cake (like every other year) cause there were all sold out for the day. Nevertheless, Coby enjoyed his cake very much. Happy Birthday to my 1st Baby! Heard from Class 95 that we may have a chance to win a Olympic medal. But seriously who needs it? Certainly not me! Who's paying the medal winner? I just hope its not me too! I don't falom the need of getting a medal. Yeah, I may not appreciate sports but, how proud can I get if its a non Singaporean winning the medal? The thing is, I don't see any economical value in getting the medal, and not that we have a day off from work or what. So why shall I be so enthu about winning the medal when the fame and glory goes to some one else and the money is not shared with me but maybe I contributed a share of it. Think again. Not that I am not patriotic to my country. But sso what? Is just a medal. I donlt care! 7 Aug 2008 - Goodbye! and Hello! I bided DSTA goodbye on 6 Aug 2008. The sumptuous buffet dinner with 10 other colleagues at the Furama City Center marked my egress of the company. It’s amazing that I can befriend with a bunch of fun-loving colleagues during my short 2-month stay. Initially, I used to think that they are dreary bunch of people, but was utterly wrong. Now, it feels sad that I am leaving the company, my colleagues, my understanding boss who in fact, supported my decision to leave cause he knew that I was given a better opportunity and prospect in my new employment. At one time, I felt that I was insensate to leave my boss in the lurch when I barely worked for 1 month in the company and served 1 month notice. 7 Aug 2008 marked the new beginning (yet again) of my working life. One word to describe my first day of work, “wearisome”. Not because of the work load, but I need more sleep. I felt mentally stressed, cause of the constant change of environment. Month of May I left ST, End of May I joined DSTA, Left DSTA during early August and here I am in this new company, new environment and new boss. I woke up early for the day and drove to CK Tang where I parked my car. Time checked, it was half an hour before 830am and since I had some time, I decided to walk down the tunnel to Orchard MRT and then to Ngee Ann City where my office is located. Many of us had the impression that the women working in the town area should looked like top business women, wearing Armani trouser suit and crisp white shirt with hair drawn off face. That was so so so wrong! Since I was early, I surveyed the bustling streets, people were striding along but they wore normal office wear and some dressed seemingly casual. I could safely refute the hearsay that women in town dressed better or looked better than those working in the sub urban areas. It is proven, by me. Anyway, when I entered my office at 830am, I was one of the earliest to arrive. Even my boss came 15min later. I was given a warm welcome and hug by my boss’s wife. She was such an affable lady and she actually recognized me, even though I was wearing my hair extension. I wondered if she noticed. I was told to sit together in a room with my boss and given a new laptop. My boss did not give me any work for the first 2 days caused I was supposed to get myself acclimated especially on the HR piece. I was brought around for induction by my boss, he introduced colleagues whom I will be working with to me and majority of them were Caucasians from the States. So there, my new job has a very different working environment as compared to the previous companies. It is quite worrying since I have no experience working in such an environment. The office is full of vigor, people were always gathering around and discussing about work, loudly. Cause Caucasians seemed to speak louder than Asians. One thing worth mentioning about my company is the vending machines. There are vending machines in every nook and cranny (drinks, snacks – chocolates, biscuits, cup noodles) and guess what, they are all FREE of charge. Suddenly, it feels good to work in such environment as compared to the previous one. I need a more energetic working atmosphere to get myself occupied. My boss told me that the company practices “flexi-timing” where I can choose to work from home if I need to, and if there is nothing much to do, I can just leave and go home earlier. And I need not be at work at such early timing as he noticed that I was quite early. Little did he know that I am avoiding ERP. Soon it was 530pm, for once, I didn’t feel that the time was crawling despite doing nothing. I dragged my heels and walked towards CK Tang for my car and headed home.